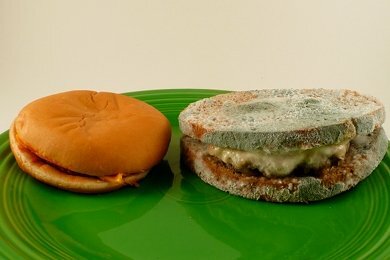 It has been over 6 months since Snack Girl posted this article: McDonald's Burger Left for Two Weeks and the photo above. A couple of other people have started similar experiments and I wanted to share my thoughts. In the last 6 months, I have thought quite a bit about the meaning of my experiment. And, recently, Sally Davies (an artist) started a Happy Meal Project which has got a lot of press. Basically, she keeps photographing a dried out Happy Meal from McDonald's. In this experiment: The Burger Lab: The Myth of The 12-Year-Old McDonald's Hamburger - Kenji attempts to better answer the question of whether a McDonald's hamburger will rot. He tries to isolate a bunch of variables (scientific sounding) to debunk the myth of the rotting hamburger. Kenji, I love ya, but you are missing the point! First of all, my experiment (and the others) were never meant to be scientific. As a veteran of bench science for 9 LONG years, with a PhD and publications under my belt, I think I know real science when I see it. My experiment was an "illustration" of the difference between fast food and homemade food. The difference here was that the McDonald's burger didn't rot after 11 days in a plastic bag and the homemade burger did. What does this illustrate? And if you review the ingredients in the burger and the response from McDonald's regarding my experiment - it all makes sense! There is no way McDonald's is going to allow a MICROBE near this food. They can't! The wrong microbe gets in there (for example a bad strain of E. Coli) and you will make THOUSANDS of people sick. Food without microbes can be a problem for some people because microbes aid digestion. Dr. Sonnenburg stated that food without microbes is "not optimal for our health". Finally, I think that where Kenji really goes wrong is that he states that his experiment is "scientific" and going to answer all the questions about the rotting hamburger. Really? I would love to critique Kenji's experiment on Serious Eats if he would let me. Hey, Kenji, you got the stomach for it? Update: Kenji wrote me yesterday to say - YES! - he would love to give me a chance to talk about my experiment, and to comment on his. - hurray! Please share your thoughts on the cheeseburger experiment. We have a newer McDonalds in town, it's been there about a 1 1/2 yrs actually. I told my 2 kids 15 and 12 that we were going to be the only family in town that doesn't eat there! So far they aren't even tempted! We have other places that are much healthier! That is actually a very good point. A lot of people like to point to McDonalds (and other fast food joints) and say results like this show that it isn't "food." This isn't strictly true. It IS food. However, in an effort to avoid lawsuits, they've gone so far out of our way to sterilize the food that there's no bacteria or microbes at all! No wonder it takes so long to decompose! Certainly not ideal for our health. i was wondering, would the same thing happen with all other fast food hamburgers? or what about ones made in fast-food type restaurants but aren't quite fast food? like a typical hamburger you get when you eat out. is this only mcdonalds?? a) when mcdonald's is reduced to issuing a press release insisting their stuff does actually rot eventually, you know you've got them in the corner. awesome! b) mcdonald's doesn't have food so much as it has "food." maybe even "FOOD" - but not really regular old food. Publicity like this probably just makes the McDonalds habit worse in individuals. I don't know what would bring the big golden arch down. What publicity is bad publicity for a brand like McDonalds? Does anyone think that place is healthy? Most people don't make their own bread, so I think this is a valuable addition to the "McD's experiments." If you look at the ingredients of most storebought buns (and bread) it's not much different than the ingredients in a McD's bun. I think this is why neither Serious Eats nor my experiment (latest update below) have seen much decomposition in the buns yet. I talked about your experiment in my video. So, when will you be sharing/talking about the experiments? Also, here or on SE?